It is a common saying that when propagation is good you can go around the world with hardly any power at all. What is said less often is how unusual those occurrences can be when using QRP. You can spend a long, long time between those times and frequencies when the magic happens. For everyone else there's QRO. For QRP contesting it comes down to a throw of the dice. Roll snake eyes and you should prepare yourself for 48 hours of drudgery. Last weekend's ARRL DX CW wasn't that bad, but it sure wasn't good for the run-of-the-mill 5-watter. My QRP era is gradually coming to a close so this was one more chance to see what I could do. Conditions did not cooperate. A week of geomagnetic disturbances and a regular series of low-level X flares combined to render conditions sub-par, even for the already low solar flux. The result is attenuation (ionospheric absorption) over many paths, especially those north of the east-west line. The effect was more pronounced on the low bands where I am already seriously challenged by my inadequate antennas. Last fall's improvements to my 40 and 80 antennas added several decibels, which was promptly consumed by the ionosphere, and then some. In this post I'll elaborate and add to the brief notes I appended to my 3830 contest summary. Perhaps I should have titled this article 'the limits to QRP', since that's really what this is about. The difference between 5 watts and 1,000 watts is 23 db. When the SNR is 50 db you can drop down to QRP, or even QRPp, and still do very well. When conditions are less than ideal you can easily drop from solid copy to no copy at all. Power, antennas and propagation set the absolute signal level at the far end of the path. QRN and QRM dictate whether it's enough to be heard. How the SNR is set does not matter. It can be noise, other stations or propagation. 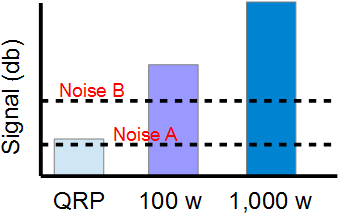 The diagram shows that the QRN level determines whether QRP will get through. At the A line it's marginal but doable. At the B line it's impossible (except perhaps with JT65). The diagram can also serve to illustrate ionospheric absorption. Imagine that the noise level is constant and that the B line represents the impact of -8 db of absorption. For QRP the result is the same. That is, we're out of luck. Notice that we're talking about the SNR at the other station. There is no reliable correlation between how well you hear them and how well they hear you. You can use your experience to guess whether you'll get through. Better yet, call them and see what happens. Although we cannot control how well others hear us (aside from switching in the amp!) the situation can often be managed to our advantage. The ways of doing this can be used by anyone, QRP or QRO. But with QRP you have to think your way through the challenges far more often that do others. Let's look at a few. You know you're near the other station's receive threshold (SNR = a very small number) when you notice a hesitation or they respond with a partial call that matches yours. You can persist, if they're patient, and hope they turn on enough filters or a better receive antenna. You are dependent on what they decide to do. Again, this is largely out of your control. When they give up, so must you. Usually. Propagation is variable. All hams know that signals wax and wane. The changes can be secular (propagation is changing) or cyclical (Faraday rotation, etc.). We tend to lump them all into one basket called QSB. If the QSB is cyclical there is a way to use it to our advantage in contest and DX exchanges, which are very brief. Cyclical QSB has a cycle time that is often frequency dependent. It is often slower on the lower bands. We can use that to our advantage. Imagine that you've called a new multiplier on 80 a few times and failed. Listen closely. Try to estimate the cycle time and amplitude of the QSB. If the amplitude range is shallow you may be out of luck. If it's deeper you have a chance. When you hear the signal rising, before it peaks, this is your moment to call. Don't be timid: turn up the keyer to 30 wpm. You want to complete the QSO before the signal ebbs or they may abandon the attempt. Should you fail, there is always the next peak. Or the one after that. It depends on how badly you want the QSO. Secular QSB is less easy to play. There are two predictable situations. On the high bands, especially on 10 and 15 meters, signals will usually rise when the sun sets, either on your end or theirs. This is due to the drop in MUF (maximum usable frequency) as ionization dissipates in the F-layer. Attenuation falls as below and near the MUF. Some logging programs will show the sunset time at the other end when you type in a call. Keep an eye on that time. If it's near sunset, here or there, drop the frequency into a memory or VFO and go work other stations. Check back every 5 or 10 minutes. When (if) the enhancement occurs you'll hear it. This is your time to call. On the low bands there is a similar situation at sunrise, whether at your end or theirs. Ionization increases, briefly boosting signal strength. I've used this successfully to work European multipliers on 80 as sunrise sweeps across the continent during the hours after midnight here. When the sunrise is yours be aware that the enhancement is short lived. You may have only 10 minutes to work every multiplier to the west before D-layer absorption drives you off the band. Another type of propagation peak has worked to my advantage on paths north and south. Towards the north there is occasionally an advantage to being north of the US since you are closer to the DX. Even with QRP you can crack a few pile-ups. It took only a few calls to get through the pile-up to work OX on 15 meters in the ARRL DX contest. To the south the skip distance increases towards sunset on 10 and 15 meters. This is to my advantage in pile-ups to multipliers in the Caribbean, Central America and the north coast of South America. Since I am further from the DX than all of the United States I am often the last to see southerly signals disappear. In late afternoon I have a good shot to work some needed multipliers by putting my QRP against the pile-ups. This works equally well outside of contests. Late one afternoon this week 4W/N1YC was too weak for me to work on 15 meters. So I waited. 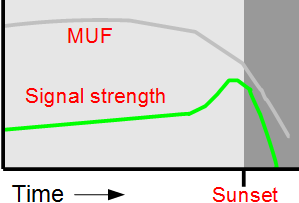 Soon the propagation enhanced as the sun dropped toward the horizon and the MUF rapidly declined. His signal increased from S0 to S5 and I easily got through. Minutes later signal strength dropped like a rock. Patience and good timing is required. Sometimes we are not heard even though the station we're calling is quite loud. This is often due to QRM or QRN on their end that we do not hear. This, too, can be dealt with. Let's guess that it's QRM. The running station in a contest (or DXpedition) will strive to hold the frequency in the face of QRM or DQRM (deliberate QRM), hoping to outlast the difficulty. All we know is that they're working few or none of the callers, and just keep CQing. Put the frequency in a memory or VFO, or self-spot on the logging software's band map. Go work other stations for a few minutes later, then try again. This may be all it takes. When the problem on their end is more persistent, as it often is in contests, a different approach should be tried. For example, on the high bands it can be difficult to work Europe with QRP in my early morning and midday. What we don't hear is how much continental QRM they must contend with. It can be fierce! As their late afternoon arrives (or evening on 20 meters) their skip length stretches out and eliminates most of their QRM. Yet the band still sounds the same on this end. By knowing how propagation works you pick this time to call the stations you've missed. This is also the time to run. Yes, you can run with QRP on 20 meters in this situation. Propagation is a reciprocal phenomenon. For two stations running the same power the absolute received signal strength is near equal. What isn't equal is the QRM and QRN. This is sometimes called one-way propagation. Let's look at a few examples. The propagation from North America to Europe and parts of Asia and Africa can open on 40 meters well before sunset. Signals are perfectly copied and push the S-meter around. Yet you are not heard by them. The SNR on your end is good. Their SNR is worse, even much worse. In Europe it is early evening. Skip is short and so the QRM within Europe is fierce. That alone raises their noise floor quite high. Your signal cannot overcome that. They are also receiving atmospheric noise from storms and other weather from a very large area of the globe. That, too, increases the noise level. Unless you run a kilowatt and a large antenna you are unlikely to have much luck. Give it up until sunset when D-layer absorption drops and absolute signal levels rise. A second example is working stations in the tropics on the low bands. Their atmospheric noise can be quite high while those of us in a colder climate have less of it. We hear them but they don't hear us. A more local example is where instead of the ionosphere it is your antenna that is at fault. On 80 meters it is challenging to put out a good strong signal for DX work. Most hams cannot get a horizontally-polarizated up high (relative to wavelength) or a vertical with low ground loss. We hear the other stations quite well since both noise and signal are reduced by our poor antennas, thus sustaining a good SNR. This is acceptable for a purpose-built directional receive antenna but not for a transmit antenna. This is my situation on 80. When my local QRN is absent I can hear reasonably well, while few hear my 5 watts. Notice how this resembles the one-way propagation example above. Unfortunately the only cure is a higher or better antenna. Or turn on the amplifier. Many choose the latter since you can only do so much with low band antennas on a city lot. In my estimation I did not do terribly well in the ARRL DX CW contest this year. It was not that I made many mistakes but that propagation did not favour QRP. My ability to run on the high bands was limited and I missed numerous multipliers on 10 and 80 that the New England stations seemed able to catch. Some of it is antennas and, I suspect, being further north a few hundred kilometers was also a factor. I was not able to repeat my low band successes in CQ WW last year. It is entirely possible that had I stayed up for another hour or two Friday and Saturday nights I could have worked several west European stations. That would have boosted my multiplier count. Instead I went to bed when I saw little or no enhancement on east European stations at their sunrise. On 10 meters I worked little in Europe even though I frequently QSYed to catch any brief opening. I was loathe to repeat the same error I made in CQ WW CW last year. It is possible that the attenuation through the disturbed ionosphere was sufficiently higher here than just to the south to explain what happened. However there is no proof. I may have simply missed it. When I ran out of stations to work on 20, 40 and 80 Saturday evening I took a break. I was not interested in sticking around for a painfully low rate. Even many European big guns couldn't hear me. I even tried 160 in desperation, but my lack of an effective antenna was like trying to become rich by buying lottery tickets. At least in CQ WW there are Americans to work and keep things interesting when there is no DX within reach of QRP. On the other hand the ARRL DX contests are a fairer comparison of how my abilities and station measure up within the wider geographic region. Could I have done better? Maybe. Better antennas would help QRP to get through, but what I have is it for this QTH. Despite the difficulties I enjoyed the contest. It was fun and I did quite well, and I did it while eating regular meals and getting plenty of sleep. That's an accomplishment! Should I operate the SSB version of the contest next weekend it will not be with QRP. Ostensibly this blog is primarily about antennas and related topics. I'll be getting back to that in the next article. Those articles take more time and effort and I've been increasingly busy lately. The "fill" I've recently written keeps the blog active while I'm otherwise occupied. I trust these have not been unwelcome by readers.